Blogs don’t usually promote other blogs, but in the vast array of blogs, the blogosphere, or perhaps even larger than that, the multi-blogosphere, there are not a lot of blogs that are worth reading. Most of them parrots the day’s conventional wisdom, or the particular angle of the many competing ideologies; copied and repeated endlessly over and over. If you read one anti PIV feminist blog, or “Obama is a Muslim” blog post, you might as well have read 10,000 of them. So when you come across one that actually educates a bit, you take notice. So from following link to link to link, I came across Slate Star Codex. The writer, “Scott S Alexander” keeps his real identity secret (don’t we all?) but is a doctor who apparently has more time on his hands than a doctor should to generate such wordy, well researched posts. Politically, he seems vaguely centrist, which, when broken down to its components, means liberal. However he’s liberal who actually seems to have educated himself on all things rightward. As I’ve noted previously, that’s exceedingly rare. So when I read his critique of Neo-Reactionary thought in his post, Reactionary Philosophy in an Enormous Planet Sized Nutshell, I was blown away by the comprehensive depth and broad based understanding of the topic that was shown. It was a better summary of Neo-Reaction than the Neo-Reactionaries have been able to produce. So although impressed, I didn’t think much more about it, until I came across another link to the blog in which he broke down the major differences of left and right that probably comes as close to providing a unified field theory of the roots of the right and left as anything I’ve read. In his post A Thrive/Survive Theory of the Political Spectrum, he overlaps right and left strategies on top of one of my favorite teaching tools, the Zombie Apocalypse. Imagine the philosophical heights Socrates might have reached had he had the Zombie Apocalypse as a model for explaining various ideas? Anyway, I recommend this blog. I learn something every time I read it. I wish that was the case with everything else I read. Scott Walker Peaking Too Early? Scott Walker’s “surprise” win of the Kansas Straw Poll may be a shock to the establishment, but its zero surprise to me. Walker’s win has generated a flurry of articles on Walker as well as an appearance on This Week. But as far back as a year ago, I predicted Walker would probably be the best all around choice for the 2016 Republican primary process. He’s a governor of a purple/blue State who rose to national prominence battling the budget, pension reform, and unions. He is attractive to both establishment types for a solid record of actually winning, and grass roots types for the ability to take on and wrestle to the ground left leaning special interests; something that’s not seen much these days. Walker’s national prominence came about with his fight with Wisconsin public sector unions. I wrote about the skirmish back in 2011 and thought at the time that Walker’s victory could have spelled the beginning of the end for public sector unions. Alas, so far that victory has remained just Walker’s. But the enmity he earned from both local and national Democrats and the left in general lead to a recall election, which Walker won handily. By Republican standards, Walker is a stand out success story. He battled the left and rather than backing down under a barrage of negative press, which Republicans traditionally do, Walker stuck to his guns and won a pretty substantial victory. Compare that to Jeb Bush, who’s sat out the various political battles since the 1990’s and now expects to ride in on a golden, donor financed chariot to be crowned the nominee based on the divine right of Bushes. The Republicans do have a deep bench, at least compared to the Democrats. In fact the Democrat’s bench consists of one person, Hillary Clinton. If she gets sick, the Dems are in trouble for 2016. But the Republican’s bench consists of establishment types that are anathema to the base of the party, like Jeb Bush, and social conservative types that are anathema to the establishment like Mike Huckabee. The converged area on the Venn diagram of candidates that both the base and establishment can live with is almost as limited as the Democrats presidential bench. Walker’s major problem with the base is his immigration position. Walker has tried to be cagey and hold every position on the issue at once. He has both supported a path to citizenship and made vague comments about “fixing the system.” However the fixing doesn’t seem to include border security or a wall. In other words, he’s a pro amnesty open borders type, which should please the establishment wing. Although I would love to make amnesty a disqualifier, the fact is there are no, I mean zero commonly mentioned Republican potential 2016 candidates that oppose amnesty. In any case if Walker does enter the race, he’ll have to quit being cagy about immigration and speak directly to the issue. But immigration isn’t even his biggest problem yet. When I made my prediction on Walker last year, it was based on the idea that the talking heads and establishment media wouldn’t pay any attention to Walker until at least the Iowa Caucuses. But the results of the Kansas straw poll show that plenty of other Republicans were thinking along the same lines as I was. 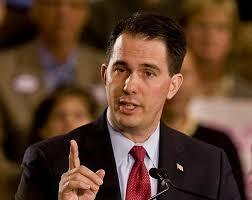 The media has rediscovered Walker this week and they will remember in short order that they despise him. Walker is like Sarah Palin and Allen West combined, with a little Tom DeLay sprinkled on top. It’s too bad he couldn’t have flown under the radar a while longer, but if there is one Republican who knows how to fight back, it’s Scott Walker.